Zeke Tiernan grew up in the Elk Mountains of central Colorado where his passion for the outdoors began. He is a converted collegiate track runner who ran his first ultra in 2008. 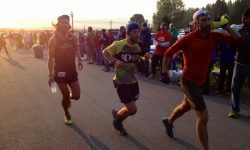 Zeke’s top performances include a sub-sixteen hour effort a Western States and a sub-seventeen hour run at Leadville. When Zeke is not out shredding the trails in and around Aspen, CO he is teaching middle school History at Aspen Country Day School, or spending time with his wife, Molly, and their daughter, Jude.